As the Cult of Mac and other websites recommend, there are Mac keyboard shortcuts you should know and use. But if you want to be a Mac power user and automator, I contend you shouldn’t spend time pressing keyboard shortcuts when there are faster ways to do it. I rarely punch keyboard shortcuts, mainly because I don’t like having to remember them, and I typically want to trigger menu items and shortcuts while my fingers are the main keys or on my trackpad. And I definitely don’t like moving my hand from my trackpad in order to punch shortcuts. So instead of typing keyboard shortcuts, I use Keyboard Maestro string triggers, BetterTouchTool finger gestures, Alfred, and SuperTab. For this article I assume that you are familiar with how to use keyboard shortcuts. If not, you can review them in a recent Cult of Mac article. 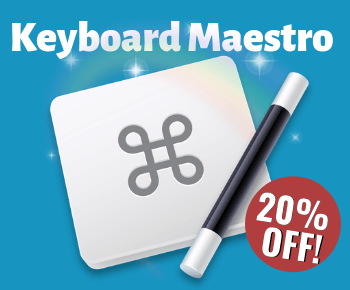 You may or may not be familiar with Keyboard Maestro and BetterTouchTool, and that’s okay. This article will show you what’s possible with both of these applications and why you should learn how to use them. My method of triggering keyboard shortcuts depends whether my hand is on my keyboard or my trackpad. SuperTab quits (and/or hides) selected applications like System Preferences, App Store, and Notebook after they have been unused in the background for a specified amount of time. BetterTouchTool: If my hand is my trackpad, I do a Five Finger Click to quickly close an application. 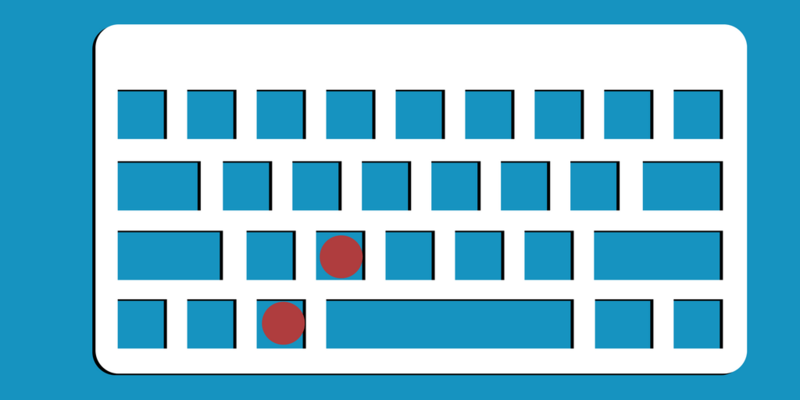 This method keeps me from having to move my hand back to the keyboard to type the shortcut. Learn more BetterTouchTool by checking out these articles and videos on my YouTube channel. Command+T / Command+W: Opens/closes a tab in a web browser. BetterTouchTool: I can use a TipTap Right on my trackpad to open a new tab window. But I rarely do that either. I have about 13 websites that I regularly visit. So I use a Three Finger Click in Safari to trigger a Keyboard Maestro palette to select and open my most visited websites. These triggers open the selected website in a new browser. The following video shows how that’s done. Alfred: Most of the time I need to open a new browser tab would be do a search or go directly to a specific website not in my KM palette. To perform these actions, I try to use Alfred to do web searches and open websites. These Alfred triggers also open a new tab browser window during the search. Looking down to locate the Command+T shortcut is not as fast as using Alfred or BetterTouchTool. Command+Tab: This shortcut triggers the default Application Switcher, which enables you to switch between applications. But the problem I have with the Application Switcher shortcut is that you have to keep the keys held down as you navigate the Switcher. With my Keyboard Maestro and BetterTouchTool setup, I don’t have to do that. 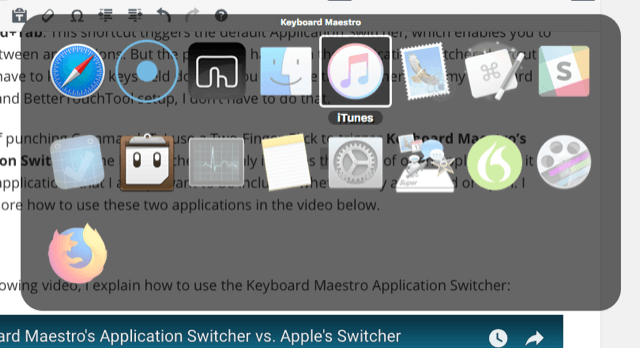 Instead of punching Command+Tab, I use a Two-Finger Click to trigger Keyboard Maestro’s Application Switcher. The KM switcher not only includes the icons of open applications, it includes applications that I always want to be included whether they are closed or open. If I want to trigger KM switcher while my fingers are on the keyboard, I type a string trigger (apsw) or I can use type the Command+Tab to trigger it. Mainly though I switch applications when my hand is on my trackpad, so I use the BTT trigger. SuperTab: I also trigger applications and other items that I can quickly access in SuperTab. More information here. Command+X, Command+C, Command+V: These commands respectfully cut, copy, and paste selected text, but I can’t punch them without looking down at the keyboard to find the keys, so I use other methods to trigger these shortcuts. 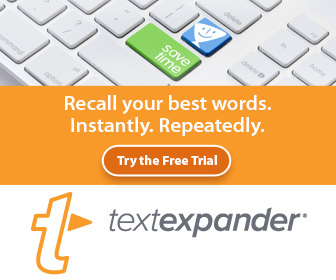 PopClip: Most of the time, I use PopClip to copy, paste, or cut selected text, especially since my hand is already on my trackpad when I selecting and copying text. Keyboard Maestro: if my hand is already on the keyboard, I can more easily paste the text I copied using a string trigger. I simply type “vv”, which triggers the Command+V shortcut. Much faster. BetterTouchTool: If my hand is on the trackpad and I need to paste the last item copied, I can also do a Three Finger Clickswipe Down to paste that text. I can also use a Three Finger Swipe Down which triggers the ClipMenu mini widow so that I can select and paste from a menu of previously copied items. Command+Shift+4, Command+Shift+3: the first shortcut takes a screenshot of any area of on your screen that you select, and second shortcut captures the entire screen. BetterTouchTool: since my hand needs to be on my trackpad when I want to take a screenshot, I can use a Three Finger Swipe Up to trigger the shortcut. But typically I don’t trigger Apple’s default screen capture application. Instead, I trigger a Screenfloat capture, because it automatically opens a quick view of the screenshot, instead of placing the shot on my desktop. If I need to take a regular default screenshot, I use a Three Finger Swipe Up+Option Key to trigger the shortcut. More about ScreenFloat here. SuperTab: It’s very rare that I need to capture the entire screen, but when I need to, I trigger the shot using its screen capture feature. For MAT readers, SuperTab is 60% off, $8, and you can also download a 30-day trial. SuperTab is an affiliate link. Thanks for your support. SuperFast Alfred: for even a faster way, I use an Alfred screenshot workflow that allows me to type a keyword and it sets up a timed full screen shot. Done. Command+Shift+H, Command+Shift+A, Command+Shift+U, and Command+Shift+D: these shortcuts respectfully open the Home, Applications, Utilities, and Desktop folders from within the Finder. But again, I don’t use them. BetterTouchTool: Instead of remembering the above shortcuts, I just click on my desktop which opens the Finder, and then do a Four Finger Tap to open a New Finder Window, and then go to the folder I need. If I needed to navigate to folders regularly, I could set up finger gestures to navigate to them. Alfred: I also use Alfred to quickly get to a particular folder, such as the Utilities or Applications folder. This is much quicker than looking down at my keyboard to locate the keys I need. I use the applications I describe above to trigger shortcuts and menu items in nearly all the applications I use. Whenever I find myself dragging my cursor to click a menu item, I always see how I can trigger that item using one of my automation applications. Let me know how much you use keyboard shortcuts, and if you trigger them using other methods besides pressing the keys.